In my previous article “The 10 Best 0 Degree Sleeping Bags”, I reviewed the best 0 degree sleeping bags available in the market. My favorite 0 degree sleeping bag is the Teton Sports Celsius XXL Sleeping Bag because it is full of great features and also comes for a decent price. I also love the Outdoor Vitals 0 Degree Down Sleeping Bag as it is compact and lightweight, and thus makes up for a great backpacking 0 degree sleeping bag. If you’re in a hurry, here are our two favorite 20 degree sleeping bags in this review. In this article, we will be talking about the best 20 degree sleeping bags. The 20 degree sleeping bags make up for being the ideal sleeping bags to be used when the temperature is near 20 degrees Fahrenheit. I personally use 20 degree sleeping bags when the temperature is cold, but not snowy or frozen. For such extreme temperatures, I use the 0 degree sleeping bags. Why Are 20 Degree Sleeping Bags Important? How to Choose 20 Degree Sleeping Bags? There are many brands which are coming up with their range of 20 degree sleeping bags. In such a case, it may be quite baffling to fish through so many sleeping bags to choose the one which is ideal for you. In order to help you out of your misery, I have made a list of my top 10 picks for the best 20 degree sleeping bags. I have personally tested and reviewed the following sleeping bags for all you avid hikers. So, without any further ado, let us jump right into the list! A great 20 degree sleeping bag is the Teton Sports Leef Ultralight Sleeping Bag. This mummy shaped sleeping bag features Diamond rip-stop shell. The microfiber PolarLite insulation of the Teton Sports Leef Ultralight Sleeping Bag provides enough warmth for cool climatic conditions. It has a good fit as well. The dimensions of this sleeping bag is 87×34 inches which is quite spacious. I loved the built-out foot box in this sleeping bag. Another feature of the Teton Sports Leef Ultralight Sleeping Bag which I absolutely liked is the 3 piece hood system which stays in your head snugly and provides warmth to your whole head area. My ears are one of the body parts where I feel the coldest. So, I just love sleeping bags with contouring hoods. The Teton Sports Leef Ultralight Sleeping Bag has got all the right features. It has added insulation in all the necessary areas, mostly the feet. The weight of this sleeping bag is 3.5 pounds. It compresses down easily into a portable size inside the compression sack which comes along with it. Thus, the Teton Sports Leef Ultralight Sleeping Bag also makes up for a great backpacking sleeping bag. Another great thing about the Teton Sports Leef Ultralight Sleeping Bag is that it is equipped with an interior pocket to store your keys, mobile, torches and other small gears. The full length zipper draft tubes of this sleeping bag have made it extra warm and not to mention comfortable. The Teton Sports Leef Ultralight Sleeping Bag is water resistant. Abrasion resistant materials have been used in the construction of this sturdy and durable sleeping bag. The zippers of the Teton Sports Leef Ultralight Sleeping Bag are anti-snag. I could not find even one bad thing about this beauty. The Teton Sports Leef Ultralight Sleeping Bag is, no doubt, one of the best 20 degree sleeping bags available in the market today. The second 20 degree sleeping bag in our list is the Teton Sports TrailHead 20F Ultralight Sleeping Bag. This sleeping bag is a high quality sleeping bag with many great features. The dimensions of this sleeping bag is 87×32 inches. The Teton Sports TrailHead 20F Ultralight Sleeping Bag is super lightweight and weighs only 2.9 pounds. This sleeping bag features a mummy shape with foot box design. The fit of the Teton Sports TrailHead 20F Ultralight Sleeping Bag is very good. I absolutely loved the spacious foot room which allowed me to rest my feet comfortably. The Teton Sports TrailHead 20F Ultralight Sleeping Bag is warm and comfortable. The fabric of this sleeping bag is breathable as well. Another thing I loved in the Teton Sports TrailHead 20F Ultralight Sleeping Bag is that its fabric is super soft to touch. The inside of this sleeping bag feels good to the skin, which adds to the coziness provided by this sleeping bag. The Teton Sports TrailHead 20F Ultralight Sleeping Bag is equipped with full length zipper draft tubes which help to trap heat better and provide optimum warmth to the body. The diamond rip-stop shell of the Trailhead 20F is water resistant and tear resistant. This sleeping bag packs down to a small size. It comes with a stuff sack. The downside of the Teton Sports TrailHead 20F Ultralight Sleeping Bag is that you cannot machine wash this sleeping bag. Other than this weakness, the Teton Sports TrailHead 20F Ultralight Sleeping Bag is nothing short of being the perfect 20 degree sleeping bag. You should definitely give this one a try. The Coleman Brazos Cool Weather Sleeping Bag is the ideal 20 degree sleeping bag for those of you who are on a budget. This sleeping bag has everything that you will need, and it comes for a very cheap price. Buying this sleeping bag is a win-win situation if you ask me. The Coleman Brazos Cool Weather Sleeping Bag is made with 100% polyester with 100% polyester filling. This sleeping bag has dimensions of 75×33 inches. This sleeping bag can fit someone up to 5 feet 11 inches perfectly. It weighs 4.25 pounds. The Coleman Brazos Cool Weather Sleeping Bag features tricot knit lining. The Fiber-lock construction of this sleeping bag prevents insulation shifting. The Coleman Brazos Cool Weather Sleeping Bag has a rectangular blanket shape. You can open this sleeping bag all the way and use it as a blanket. The zippers of this sleeping bag are anti-snag zippers. All the materials in this sleeping bag are of good quality. The Thermo-lock system in the Coleman Brazos Cool Weather Sleeping Bag helps to reduce heat loss. This sleeping bag is very warm and comfortable. The Coleman Brazos Cool Weather Sleeping Bag has down insulation. Another great feature of the Brazos Cool Weather Sleeping Bag is that you can zip two of these bags together for more space. The Coleman Brazos Cool Weather Sleeping Bag is machine washable. It comes with a stuff sack. It took me quite some time to get this sleeping bag inside the stuff sack. Though not impossible, stuffing this sleeping bag can be a little tricky and time consuming. Even though the Teton Sports Celsius Junior Sleeping Bag has been designed especially for kids, adults who have short and petite physique can use this sleeping bag with ease. The Teton Sports Celsius Junior Sleeping Bag has dimensions of 66×26 inches. A person up to height 5 feet 5 inches (and even that’s pushing it) will fit snugly inside this sleeping bag. This high quality sleeping bag weighs 2.65 pounds. The shell is of taffeta whereas the lining is 100% brushed poly flannel. This sleeping bag features SuperLoft Elite 4-Channel Hollow fiber. The Teton Sports Celsius Junior Sleeping Bag is rectangular in shape. This sleeping bag is easy to pack inside the stuff sack which comes with it. The Teton Sports Celsius Junior Sleeping Bag is durable as well. It is also very warm and comfortable. You can zip two Teton Sports Celsius Junior Sleeping Bags together. The materials of this sleeping bag are sturdy. The zippers are anti-snag. There is also an inner pocket in this sleeping bag. The Teton Sports Celsius Junior Sleeping Bag is equipped with full-length zipper baffles to prevent the sleeping bag from turning drafty. Apart from all the wonderful features, another great reason to purchase the Teton Sports Celsius Junior Sleeping Bag is to aid in the philanthropic deed the company has been doing. For every purchase of the Teton Sports Celsius Junior Sleeping Bag, a certain portion is donated to breast cancer research. So, all the more reasons to fall in love with this wonderful beauty. I would highly advise you to purchase the Teton Sports Celsius Junior Sleeping Bag if you are looking for a sleeping bag for your kid. With the Abco Tech Envelope Lightweight Sleeping Bag, you will not have to worry about sleeping in damp or wet climatic conditions. This 20 degree sleeping bag is waterproof and weather resistant, designed to keep you warm and dry in all kinds of climatic conditions. The Abco Tech Envelope Lightweight Sleeping Bag is extremely comfortable. This S-Shaped quilted design sleeping bag weighs 4.32 pounds, and makes up for the perfect fall sleeping bag. The Abco Tech Envelope Lightweight Sleeping Bag has 100% polyester lining. The durability of this sleeping bag has been enhanced by the 210T polyester on the outer side of the sleeping bag. The dimensions of this sleeping bag is (75+12) x30 inches. The Abco Tech Envelope Lightweight Sleeping Bag is made with non-allergic fabric which is also very skin friendly. This sleeping bag dries quickly. The Abco Tech Envelope Lightweight Sleeping Bag is a high quality sleeping bag which you can get for a very decent price. It comes along with a compression sack with straps. Getting the sleeping bag inside this sack is fairly easy. You can machine wash the Abco Tech Envelope Lightweight Sleeping Bag. The Kelty Cosmic 20 Degree Sleeping Bag is a mummy shaped sleeping bag. The insulation of this sleeping bag is 100% water resistant 600 fill Power DriDown. The shell is 50D down proof polyester rip-stop shell whereas the liner is 50D polyester taffeta liner. The regular size of the Kelty Cosmic 20 Degree Sleeping Bag can fit a person up to 6 feet of height. This version weighs 2 pounds 13 ounces and has dimensions 72×31 inches. The Kelty Cosmic 20 Degree Sleeping Bag is equipped with draft collar for preventing heat loss. The materials of this sleeping bag are water resistant. The Kelty Cosmic 20 Degree Sleeping Bag comes with a nylon stuff sack. You can easily roll up the sleeping bag and stuff it inside this sack. This sleeping bag makes up for compact packing. It is also lightweight. The Kelty Cosmic 20 Degree Sleeping Bag is of high quality. The quilt through construction of the Cosmic 20 has made it very warm and comfortable. Now talking about the shortcomings of the Kelty Cosmic 20 Degree Sleeping Bag, it is very expensive compared to rest of the products in this list. Also, the manufacturer claimed the zippers to be anti-snag. But the zipper of the sleeping bag I was trying snagged on the very first try. So, durability is a part where I am skeptical about the Kelty Cosmic 20 Degree Sleeping Bag. A good value 20 degree sleeping bag is the Ledge Sports Featherlite 20F Ultralight Sleeping Bag. This sleeping bag has Dobby Diamond 250T rip-stop shell and soft-tech II 210T liner. 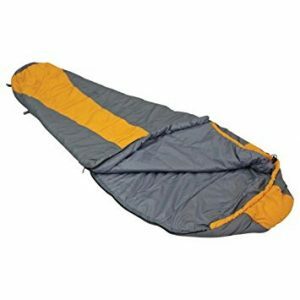 The dimensions of the Ledge Sports Featherlite 20F Ultralight Sleeping Bag is 84×32 inches. It weighs 3.4 pounds. The Ledge Sports Featherlite 20F Ultralight Sleeping Bag has continuous filament fiber fill. This mummy shaped sleeping bag packs down small for a synthetic sleeping bag. I found the fitting of the Ledge Sports Featherlite 20F Ultralight Sleeping Bag to be quite snug. Having said that, the tightness does not feel very constricted. So, the fitting is quite close but still comfortable. Talking about the good sides of the Ledge Sports Featherlite 20F Ultralight Sleeping Bag, this sleeping bag is warm. It is of a good quality and feels durable. Another great 20 degree sleeping bag for the kids is the Kelty Little Flower 20 Degree Sleeping Bag. This sleeping bag weighs 3 pounds. It has Cloud Loft insulation. The dimensions of this sleeping bag is 72×28 inches, which can fit a person up to height 5 feet 4 inches comfortably. The Kelty Little Flower 20 Degree Sleeping Bag is mummy shaped, with offset-quilted construction for extra warmth and durability. The warmth has been enhanced by the full-length draft tube construction of the sleeping bag. The Kelty Little Flower 20 Degree Sleeping Bag is a synthetic sleeping bag with 66D polyester taffeta shell. It also features a flip over hood. I absolutely love this sleeping bag. It is very warm. You can sleep cozily and peacefully inside this sleeping bag as if you were sleeping in your own bed. The Kelty Little Flower 20 Degree Sleeping Bag is a good quality bag. The anti-snag zippers come really handy as even if the kids are not careful enough with the zippers, it will not really be a problem. The Kelty Little Flower 20 Degree Sleeping Bag comes with a stuff sack. It is machine washable. The Winterial Mummy Sleeping Bag is a good quality sleeping bag which will do its work just fine. The dimensions of this sleeping bag is 80×27 inches and weight is 3.6 pounds. People up to height 6 feet 2 inches can fit inside this sleeping bag. The Winterial Mummy Sleeping Bag is a mummy shaped sleeping bag equipped with Thermo-lock insulation and full-length draft tubes, both of which help to trap heat better, prevent heat loss and enhance the warmth of the sleeping bag. The Winterial Mummy Sleeping Bag is warm and comfortable. It is easy to compress into a small size. You get a stuff bag for storage. A feature I loved in this sleeping bag is the cinch drawstrings which can be cinched to secure the sleeping bag and prevent it from being drafty. The last sleeping bag in our list is the Kelty Dualist 20 Degree Sleeping Bag which has synthetic insulation. This sleeping bag is equipped with 550 Fill-Power Down and 50D Polyester Taffeta shell. The Kelty Dualist 20 Degree Sleeping Bag has a hybrid construction known as the ThermaDri Construction which is a mixture of DriDown and ThermaPro insulation. The Kelty Dualist 20 Degree Sleeping Bag’s medium version weighs 3 pounds 3 ounces. Its dimensions is 72×31 inches which can fit a person up to the height of 6 feet. This is a mummy style sleeping bag with water resistant down fill. There is a natural fit foot-box at the end of the sleeping bag. The Kelty Dualist 20 Degree Sleeping Bag is easily compressible. It dries faster as well. This sleeping bag is also breathable and comfortable. It will provide you with the required warmth. The zippers of the Kelty Dualist 20 Degree Sleeping Bag are smooth. You get a stuff sack with this sleeping bag. The downside of the Kelty Dualist 20 Degree Sleeping Bag is that this sleeping bag is quite expensive, and there are similar sleeping bags with lesser price available in the market. As I have aforementioned, 20 degree sleeping bags are ideal for usage during cold climatic conditions. Women can use the 20 degree sleeping bag when the temperature is around 35 to 40 degrees Fahrenheit, whereas men can use these sleeping bags for temperature of 30 degrees Fahrenheit. This is because women need 5 to 10 degree warmer sleeping bags compared to men. You do not have to follow this rule so strictly. You may use the 20 degree sleeping bags comfortably, as long as the temperature does not fall below 20 degrees Fahrenheit. The main work of any sleeping bag is to provide you with a warm and comfortable place to sleep and rest in. 20 degree sleeping bags will provide you with optimum warmth in the above stated temperatures, and also fulfill the other liabilities of being a sleeping bag. They will provide you with comfort- which allows you to regain your vigor for the journey next day. Sleeping bags protect you from insects and water. They act as an insulation between you and the ground. You can place the sleeping bags anywhere and at any time to get some relaxation. Sleeping bags are a must for any hiker. One should see these as investments rather than expenditure because they truly serve you for a long period of time if used wisely and carefully. Now of course the first thing you will look at while purchasing a 20 degree sleeping bag is the temperature rating. But just ensuring that the temperature rating of a certain sleeping bag is 20 degrees Fahrenheit will not suffice. There are some other factors which you will have to thoroughly check before making the purchase. I have explained some of these factors below. There are two basic types of insulation when it comes to sleeping bags. The first is down insulation. Down insulation sleeping bags have many advantages. They are durable, sturdy, lightweight, retain heat better and are easily compressible. As a result, they make up for great backpacking sleeping bags as well. However, they are quite expensive. The second type of insulation is synthetic insulation. Synthetic insulation sleeping bags are cheaper compared to down insulation sleeping bags. Synthetic insulation bags retain heat better when wet and also dry quickly. But they are heavier and bulkier than down sleeping bags. Sleeping bags are among the heavier of your hiking gears. Synthetic sleeping bags are heavier than down sleeping bags. You want to choose the sleeping bag whose weight you will be able to carry around easily during the hike. So, I highly recommend you to take down sleeping bags for longer treks and synthetic sleeping bags for shorter hikes. The 20 degree sleeping bag you choose should be able to provide you with the required warmth. Two sleeping bags may have 20 degree temperate rating, but that does not imply that they will provide the same warmth. Warmth of a sleeping bag is also determined by the space, size and other factors of the sleeping bag. For example, snug fitting sleeping bags will provide more warmth that loose fitting sleeping bags because heat will be trapped better in the former sleeping bags. Also, sleeping bags which have more insulation will trap heat better and be warmer than the ones with less insulation. Similarly, a sleeping bag with draft tubes will also provide more warmth by preventing the sleeping bag from being drafty. Comfort is of utmost importance when it comes to choosing the right sleeping bag. You do not want to spend your whole night tossing and turning in order to find the perfect and cozy sleeping position. The sleeping bag should have enough space for you to move around and still be snug. Comfort is also determined by the warmth provided by the sleeping bag, the softness of the sleeping bag’s fabric, the shape and size of the sleeping bag, etcetera. The sleeping bag you choose should match with your body structure. You want to choose the sleeping bag according to your height. Sleeping bags come in three different sizes of small, regular and large. Choose the size which matches with your physique. Remember that there should be space inside the sleeping bag for you to move around but not much so as to make the sleeping bag drafty and cold. Some other accessories you may want to check in the sleeping bag are pockets, draft tubes, foot compartments, hoods, compression sacks, sleeping pads, two-way zippers, and so on. All the 20 degree sleeping bags in this list are great value sleeping bags which feature advantageous qualities for decent price ranges. However, I will choose one particular sleeping bag as my favorite. I found the Teton Sports Leef Ultralight Sleeping Bag as the best 20 degree sleeping bag among all the 10 in today’s list. The Teton Sports Leef Ultralight Sleeping Bag is worth all the money you can muster on it as it is full of wonders. The Teton Sports Leef Ultralight Sleeping Bag is warm with extra insulation in all the right places. It is very cozy and not to mention provides a good fit, with enough space to move around. It is water-resistant, sturdy, compressible, compact and comfortable. I have just fallen in love with the Teton Sports Leef Ultralight Sleeping Bag. All the 20 degree sleeping bags in this list are the best of the bests. Nevertheless, I want you to scrutinize through the list to find the sleeping bag which will match your necessities.